Our product range includes a wide range of roof ventilator, rotary ventilator and roof top ventilator. 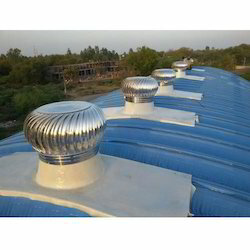 Our organization is actively engaged in manufacturing of Roof Ventilator Which Are Very Useful To Exhaust Heat, Smoke & Fumes. A perfect partner of Pre Engineering Buildings, the Rotary Ventilators application is across various industries manufacturing from a needle to aircraft . In case there is no wind If air in the roof is hotter than the ambient air outside then the vent will allow that air to escape and help reduce the attic temperature. This solution is equipped with the ventilation which helps in keeping the building cool and maintaining the perfect working conditions. The sheds are prepared using the reliable materials like SS and Aluminium that are exposed to the climate. The Rotary Ventilators are designed to withstand high rain and winds and is known for the durability and resistance against corrosion and abrasion. Roof Top Ventilators are natural air ventilation systems. 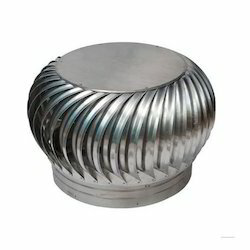 Rooftop Ventilators utilize the Velocity Energy of wind to induce air flow by Centrifugal Action. The spinning vanes create a region of low pressure, which pulls and throws out hot stale air from below and causes fresh cool air from the outside to come in. The slightest breeze causes the Fan to spin and even after the breeze has stopped the 'Fly Wheel' Effect of the Rotor Cage will use its stored energy to continue providing ventilation. Suction is maintained even at low wind velocities. The Convection Thermal Currents are given a boost by the FRP Dome. Cooler air from outside will rush into the negative space within the building in order to maintain an equilibrium. 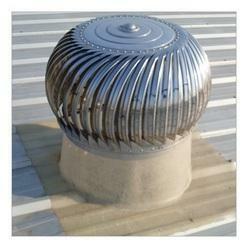 Rooftop Ventilators help exhaust smoke, obnoxious gases fumes, dust and heat from their place on installation. Besides providing ventilation, Rooftop Ventilators (due to translucent FRP Domes) help improves the natural lighting in the shed area and therefore helps create a congenial and healthy working environment. Our Rooftop Ventilators offer excellent value for money and are a viable alternative to conventional Exhausts, which run on electricity.